FlexGuard is made to order and, in most cases, is installed in runs of 10 to 150 feet. 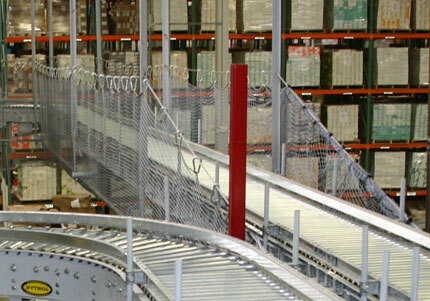 Standard conveyor netting is available for different weight loads from 150 lbs. to 1,000 lbs. Special mesh systems with capacities up to 10,000 lbs. can also be ordered. Installation is not difficult and we supply a variety of brackets and hardware, depending on the application. Design: We can provide custom designed safety netting for almost any material handling application. Simply forward drawings of your racks or conveyor system, including elevations, and we will provide a proposal and quotation. Finished netting is shipped with all appropriate hardware, ready to install.